Garbage Gang Cheap Toys are different than Garbage Pail Kids Cheap Toys. 1)	They come in a different box. 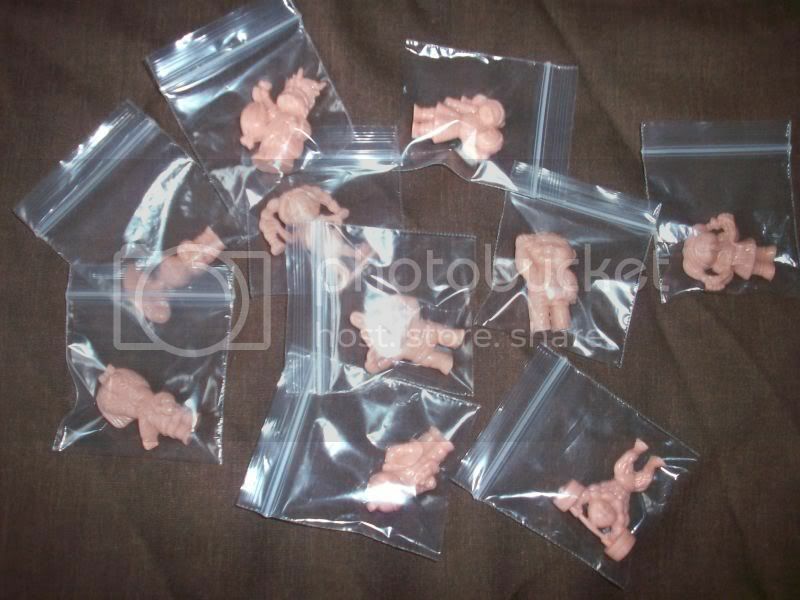 3)	The toys themselves where the first to be made of hard plastic. 4)	The colors of the toys are even different! The following sentence is a sentence that those ‘few people’ have been waiting a long time to hear…. 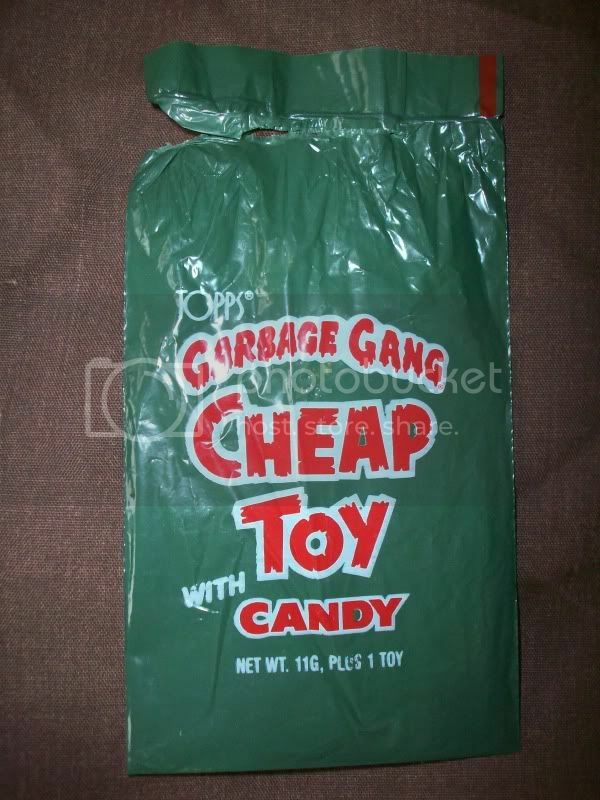 Garbage Gang Cheap Toys were made and distributed in 1986, probably late 1986. We know this now because we seen the back of a GG wrapper, and the sides and bottom of a GG box, for the first time last month! And, the Uk Seller is a witness, and lucky for us, he has a great memory. In 1986, during Series 2 of the Uk Garbage Pail Kids (minis) release, he saw a box of Garbage Gang Cheap Toys on the counter near some Garbage Pail Kids*. Half the box remained, and he decided to buy them all and asked the clerk if he could have the display box to store all his GPK cards and Cheapies after he opened them. The clerk didn’t mind. Rob doesn’t remember why he saved one of the wrappers, but remembers being impressed how GG Cheap Toy packs were opened. 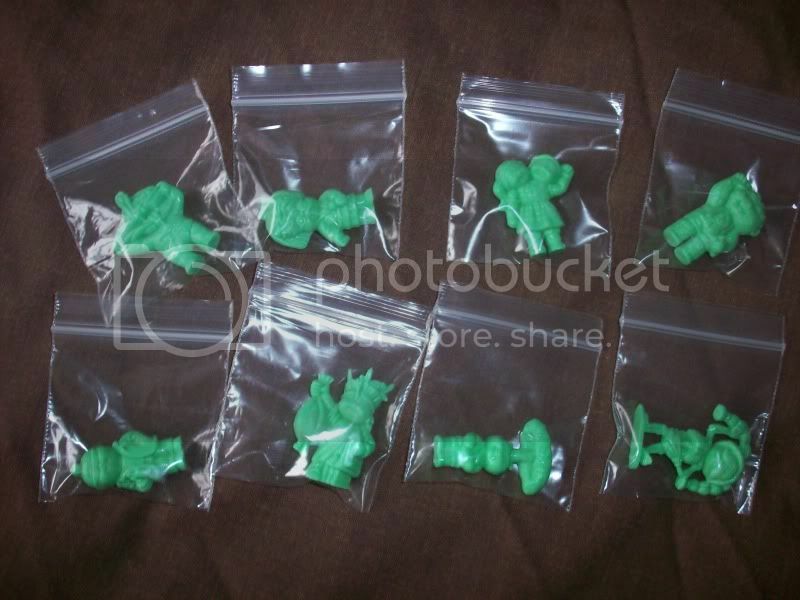 There is no yellow twist tie on them, like in all the other Cheap Toy packs! The bags are sealed with a thin wire threaded through the top of the bag, sort of like a bag of dog food, but instead of string, he remembered it being a thin metal wire. This explains why his wrapper stayed in nrmt to mint condition! The Garbage Gang wrapper has proven to be the greatest artifact of all, perhaps in all of Cheap Toys. When I, and probably other collectors, saw the back of it (on eBay) I literally lost my breath(and mind, when I entered ‘that’ bid). First, let’s cover the facts: the wrapper’s front displays the, then new, Garbage Gang logo at top in a rainbow arc. The logo looks surprisingly natural, and could be missed because of it. The weight of the contents is in grams, instead of ounces. The back of the wrapper is crowded with 4 translations of the candy’s ingredients. There is also the printing date of “1986” in a new font. Ask yourself, had GG Cheap Toys been made and distributed in 1987 or 1988 or 1989 or 1990 or 1991, then why would the NEWLY designed wrapper have a NEWLY designed 1986 printing date…if 1986 was the wrong year? Besides, Rob bought these during Uk Series 2, which were distributed in 1986 in England. We are making this point to officially disprove the old theory that GG Cheap Toys came out in …gulp....1991. UkRob has ALWAYS argued that he saw Aquas and Cinnamons in the 1980s. Sorry UkRob! The second translation is in German, the third, Dutch, and last in French. 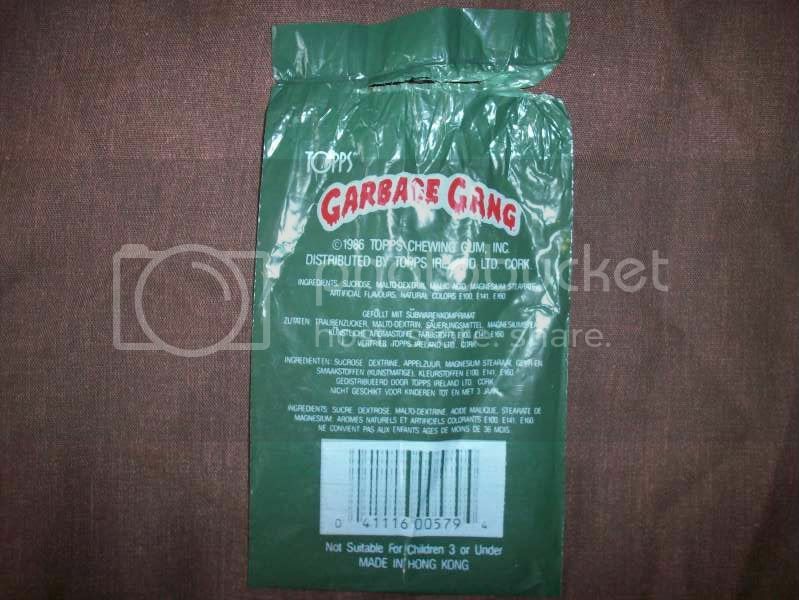 An old unsolved mystery surrounds whether or not GG Cheap Toys were distributed to New Zealand and Australia, such as the Garbage Gang cards were in the early 1990s. That search seems a bit silly now with the distribution date as 1986 and them, now with possibility that these might have gone to Germany, Netherlands, and France! Of all 5 Cheap Toy boxes, the Garbage Gang box is the most simplistic. Information was taken off not added. The lid has the new logo of course, but the white printed circle, as on the Uk box, was deleted. The box’s weight in grams was left. However, the sides of the GG box were stripped down to a picture of Leaky Lindsay, the logo, and 24 ct. Even the ingredients were omitted! These Irishmen could have put pub crackers in the box and you’d never know it until you got home! The box bottom is the biggest disappointment of all; it’s identical to the Uk box. 579… 5 7 9 …the combination to my heart lock btw. The greatest aspect of the GG CT release is the 4 new, exclusive colors. These colors are known to collectors as UK Peach, UK Blue, Cinnamon Red(or sometimes UK Red), and UK Aqua. The plastics are much harder than the denser, rubbery USA examples. Garbage Gang toys also float, such as in a cup of water, which is especially helpful in sorting UK Peach and Blue from USA Base peach and blue colors. Uk Peach is most similar to USA’s Dull Peach, but Uk Peach is more neutral (gray added). Uk Blue is slightly more dull than the USA colors too, and is a mid-range blue. Uk Aqua is lighter than Canadian Aqua, and white appears to have been added. Cinnamon Red is, likewise, lighter than the USA reds. 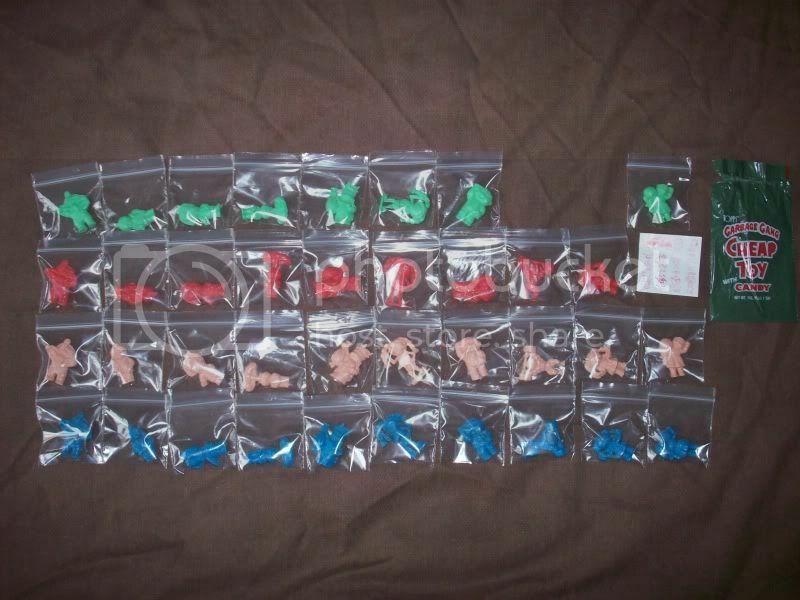 Overall GG Cheap Toys come off as a pastel color set of Cheap Toys! Cinnamon is the oddest of all CT colors. This color has tiny, random sized brown flakes that seem to float in the slightly translucent reddish, orange murk. Unfortunately, Cinnamons are prone to fading and a significant portion of known Cinnamons have light damage. All plastics decay in long exposure to sunlight, but this is a color pigment issue, and not common dry-rot. 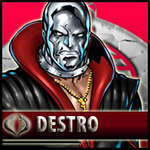 Recently another Rob from the Uk, Robiero, pointed out that Garbage Gang Cheap Toys are rarer than Novo Bonbons. This statement sent me reeling and searching through my records only to find that was true! IT WAS!! Or, at least, it was. Strangely, 3 separate, large GG CT lots appeared on eBay, 2 since his claim. According to my log, Novos and GGs are now too close in number to call, both in the 150 + or – 10 range. The point is, with all the drama surrounding Novos over the years, combined with Robiero’s findings, and with the new market prices smashed for GG toys, especially Aqua, this might be a signal for new collector interest in British…….or should I say, German, or Dutch, or French, or Irish, or Chinese, or whatever the f**k these cool toys are. “The History of Cheap Toys” will thus be edited SOON, thanks for your support and patience! *Like many Cheap Toy and Garbage Pail Kid collectors, Rob also collected Topps Garbage Can-dy, and I bought tons of these as a kid myself! Rob bought some G-Candy at the same counter and the same day as the Series 2 Uk minis, GG Cheap Toys. Uk Rob, not to be confused with Robiero or Rob Cox lol, shared a scan of a Garbage Gang Ad Sheet that showed a box of Garbage Can-dy in a newly designed Red box with Garbage Gang-TYPE lettering and 4 new can colors. This ad sheet also featured Garbage Gang Candy. This connection will be later researched. Rusvan, could be a gg toys test set? hey Russ very interesting info especially the way the wrappers were sealed. all i know is for a fact that i brought garbage gang cheap toys in high wycombe england at the same time of the garbage gang 91 release. not sure if that was 90 or 91 but definatly 1 of those years. 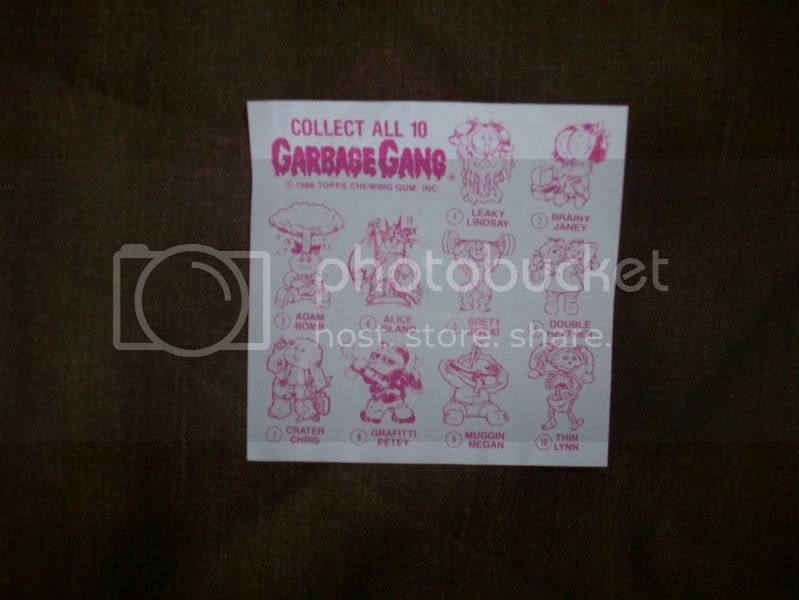 the name garbage gang wasn't used til later so them being released at the same time as series 2 is impossible in my opinion because u then had gpk series 3,4,5 and 6 before u got to garbage gang. why would they put 1986 on the newly designed wrapper if that wasn't when they were released. take a look at the uk garbage gang 91 / 92 and mini gum release. they all say 1986. does that mean they were released in 1986 no. in fact i think all pre ans releases had 1986 on them. please correct me if im wrong. for us to know for sure the release dates we would need some hard evidence of the release date or words from topps ireland themselves. im not saying the guy who sold the box and wrapper is lying im just saying that everyones memories including mine of 20+ years ago is likely to be distorted in some way. so im sorry to have to say this Russ but this proves nothing. some more info ive got to show that im right about memories being distorted. Russ u say the guy who sold the box used that box to store all his gpk cards in which were then put away for many years. well do u know what else was stored in the box when he recently uncovered it from storage. there were mini garbage gang gum stickers and garbage gang 91 cards which we know were released in the 90s and thats a fact. so that shows that he was collecting garbage gang releases in the 90s. so its quite possible that the true date he got this box was indeed the 90s. i also think he had 1 cheap toy that did not float so is likely to have come from a uk gpk cheap toy box. this makes me think that the box he was talking to u about from 1986 was actually a uk gpk box. and because of this being a 20+ year memory could easily have got confused with being a garbage gang box. which he may well have got at a later date. don't u think ? ...And one thing I was confused about was he sold me TWO Garbage Can-dy Can Color Set (4 in each) and they were from different years... Of course, he went blank when I asked for information about those! i don't know if anyone has tried to do this before but i have emailed topps ireland ( now merlin ) to see if they can clear this up. lets see if they get back to me. Thanks Robiero, I'll go back and rewrite some s**t, glad I didn't rewrite the "History" one already... I had to put UkRob on the spot, but I'd like for him to reply first(while I go bang my head against the wall . ...I will say, it's 'better' for the Cheap Toy hobby if GGs were released in 1990-1991, and so, maybe it's good we're going through this Re-DISCOVERY ERA. You ROCK Rob!! Btw, what do you mean, by "Merlin" . You know the Candy Novielty Inc in Hong Kong now goes by Au'some. i think i remember ukrob telling me that the floaters he got in the 80s were sent to him from a friend in wales. he did not know if they were from a gpk or gg box. ok i was gunna wait until all my bits and pieces arrived in the post but its almost all here now, just waiting for my uk aqua green brett sweat to arrive but i cant wait for that so here are my pics. the 1st 2 months of 2011 has been huge for my collection finding 12 figures a checklist and a wrapper. i only need 2 more figures now and still want to find a sealed pack and a sealed pack of crummy candy. 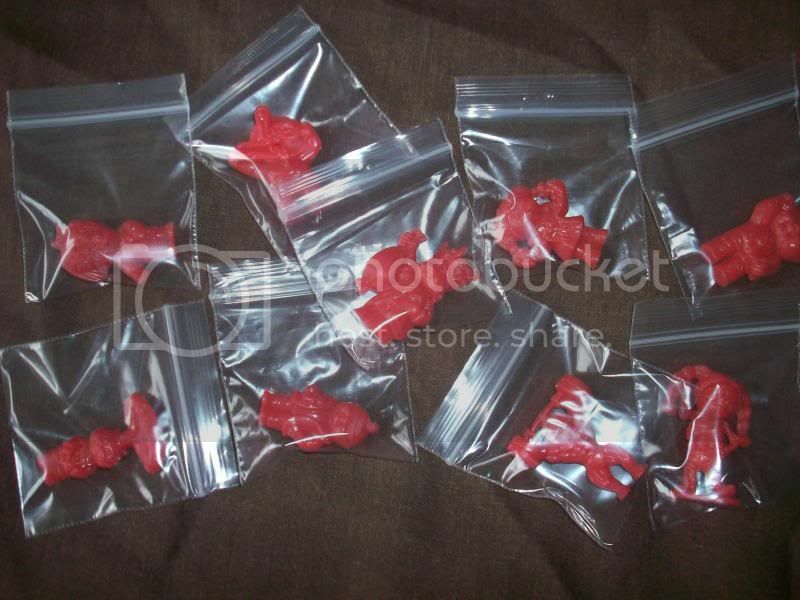 the crummy candy is still a mystery, was it disk shaped like the regular cheap toy candy and if so did it have garbage gang on or were they shaped like the 2nd series candy or like the candy from the garbage candy. There is no yellow twist tie on them, like in all the other Cheap Toy packs! The bags are sealed with a thin wire threaded through the top of the bag, sort of like a bag of dog food, but instead of string, he remembered it being a thin metal wire. This explains why his wrapper stayed in nrmt to mint condition! 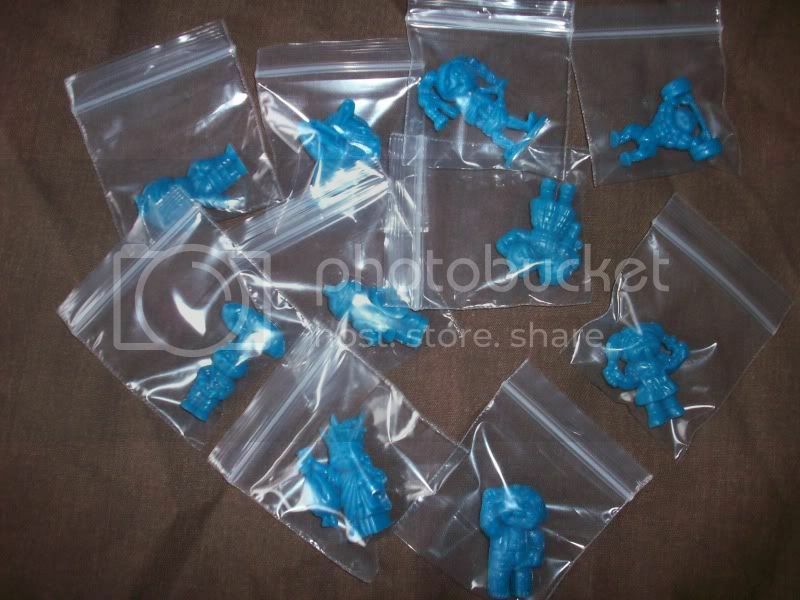 the actual seal of the packs was exactly the same as all cheap toy packs. as u can see from this picture of my wrapper that has been ripped open below the seal leaving the seal of the pack still intact. however the way the bag was tied might well have been the way u say and without the yellow twist tie. I am seriously jealous that both you and Russ have GG CT wrappers and i dont!! Just to pick up on some points Russ and Robiero raised, i got my UK CT floaters(aquas and Reds, no blues or peaches) in the 80s. I dont know the year, and i dont know if they were from GG or GPK packs/boxes. They were gievn to me by a friend who had gone on holiday to Wales. He bought the CTs and some UK 6th series cards for me, beacuse he knew i was GPK obsessed. FUGG Man...That is awesome...What's next the display box? Nope, my wrapper was sealed with a micro wire. The seller said so, and the top of the pack has hundreds of tiny holes where the wire threaded the pack! 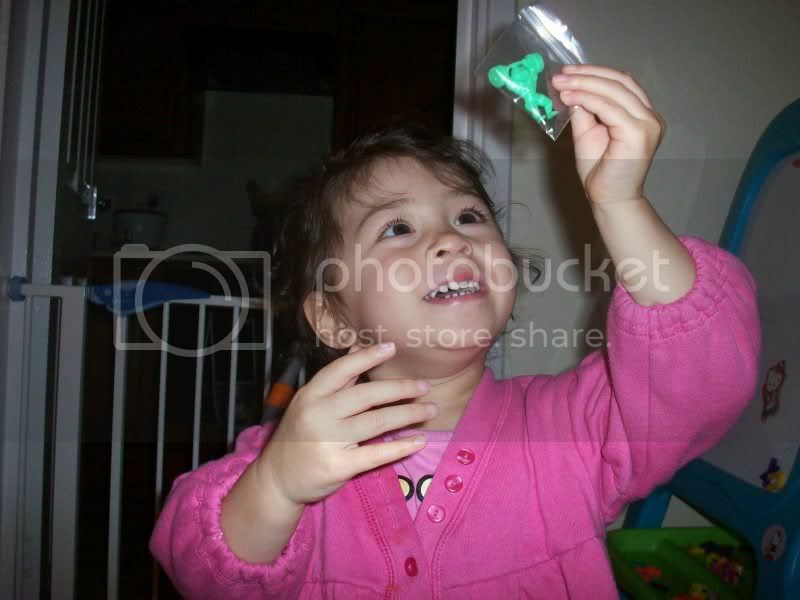 I will post micro photos of the GG wrapper when I go to the safety deposit box next week. It's a very special wrapper! Yeah, I don't know if this is common knowledge but with the GG `91 release they had GG figures, Garbage CAN-dy and the small 5p stickers as well, I went on a collecting spree when all this came out as I missed out on the earlier GPK releases. I wrote to Topps when these things came to an end in the newsagents asking if they were gonna release anymore, they kindly sent me some unreleased GG `92 packs with some random Batman and other stickers, although I had lost interest for collecting by the time GG `92 was released so I don't know if it was just the stickers available for them, I can't even remember them being in the shops, but they obviously were. Ben, what month/season/year it was exactly-that GG Cheap Toys were in stores?! 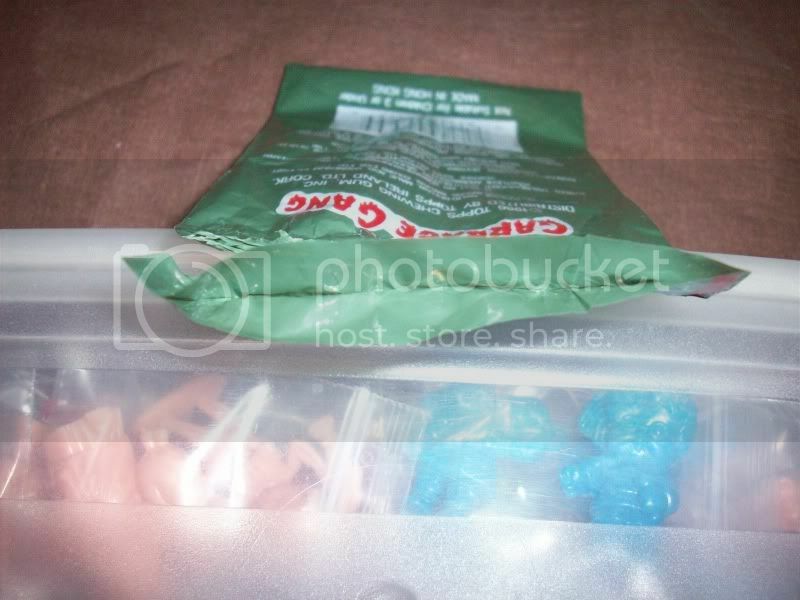 Go ahead and post it, it's always nice to see a sack of Crummy Candy. Too bad you don't have a GG bag of candy. well i have two diff types of bags of candy, and they are two diff diameters of candy. so i was wondering what the diff is between the two. i'm not sure keen on how to post pics yet, but i will give it a shot here in a little bit. i have a buddy coming by in a few to sell some video game crapola to. Yes, there are. Let's take a look!